My kids love scavenger hunts--most likely because they usually get a treat at the end of them. A few weeks ago when I was at the library with my four year old we picked up this cute book called Max and Ruby's Treasure Hunt. 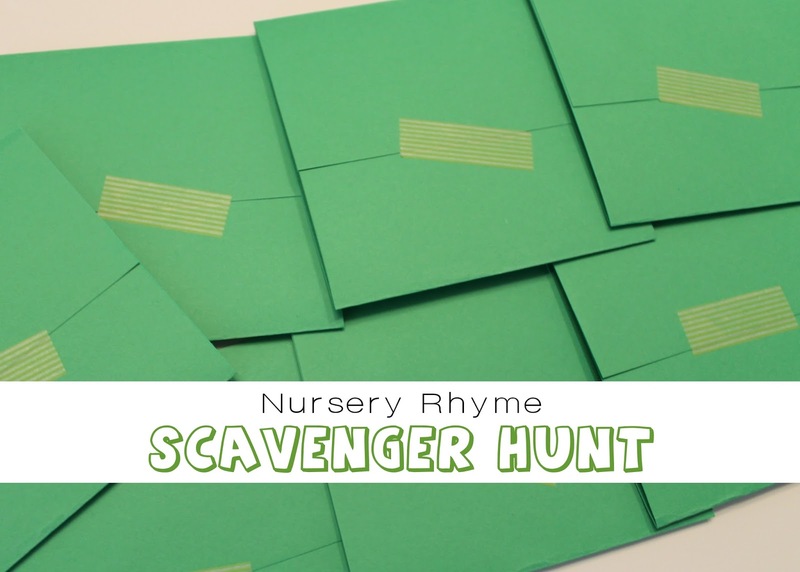 I loved how the grandma in the story used nursery rhymes for the treasure hunt clues. The book had cute little lift the flap envelopes on each page and my four year old had so much fun trying to figure out the clues along with Max and Ruby. I thought it was such a fun idea that I decided to recreate something similar for a fun St. Patrick's Day surprise for my kids. I created eight clues using nursery rhymes and placed them around the house. When the kids arrived home from school they were greeted with this sign. Jack jump over the ________. I frightened a little mouse under her ________. There was an old women who lived in a ________. The mouse ran up the ________. And the dish ran away with the ________. Little boy blue, come blow your ________! And so her poor dog had none. And at last in they headed to the cupboard! This was end of the treasure hunt and where they found their treat--little pots filled with the best treasure ever, chocolate! We usually don't do much to celebrate St. Patrick's day at our house but if I have the time to throw something together I do think it's a fun way to make childhood magical. The kids had a blast tracking down the clues and the joy on their face made it very much worth my time putting it together. These kiddos of mine won't be little forever. We also had our traditional rainbow fruit salad for lunch. Healthy and delicious! super cute idea. I love the idea of using nursery rhymes for clues... I'll have to do that next time. So creative! In a couple of years when Otis cares about these things I will be scouring your archives for these kinds of ideas (they won't look quite so cute when I do them though, but hopefully he won't care!). What a great idea! You are such a fun mom!